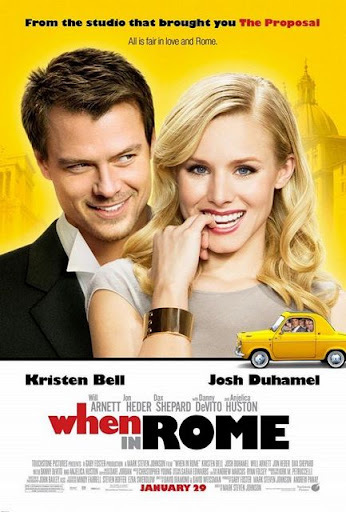 An ambitious young New Yorker (Kristen Bell), disillusioned with romance, takes a whirlwind trip to Rome where she defiantly plucks magic coins from a fountain of love, inexplicably igniting the passion of those who threw them in: a sausage magnate (Danny DeVito), a street magician (Jon Heder), an adoring painter (Will Arnett) and a self-admiring model (Dax Shepard). But when a charming reporter (Josh Duhamel) pursues her with equal zest, how will she know if his love is the real thing? Yesterday went to watch When In Rome (2010) the movie with Wern and here's a few pictures taken when we redeem the tickets from Nuffnang @ ChurpChurp. If you haven't know what is ChurpChurp. ChurpChurp is an advertising network for Twitter. Their advertisers will specify the tweet contents to be propagated, also referred to as a Churp, so when you sign up and allow them to post Churps among your tweets, you earn money! Start register one if you have a Twitter acount~! XinXian(Fresh026) is arranging the new Churp2 Badges. "Fiesty on Twitter", the badge said. Dear Nuffies who distributing the movie tickets to all Churpers. What would you do when your ex-boyfriend dropping by to say he is going to marry with someone like her, but not her? It is definitely a very heard breaking moment. There is one moment where Beth pick up a few coins that has been thrown into Rome's "Fountain of Love". After that she was being after by various guy along the whole time until she break the magic. One of the funniest guy that I like is the Magician, he did some "awesome" trick and it did work at last. This guy, Nick that Beth not sure if he is under the "love curse" or truly love her. Beth is not ready to fall in love and get heart break again. And she always said "I will marry a guy when the guy is more important than my job". So guys and girls, please don't hide/cover yourself under protection just because scared of being hurt. Just do it~! That's what Nike always say. And if you somehow had a bad love experience, look at the brightside! He/she has taught you to become a better person! You wouldn't know there is a better person out there until you open your heart. AIKZ~ u watch with wern already? XeRoZ dun like romantic comedy de..especially with my idol Josh Duhamel acting inside. T_T i wan churp churp too!!! Watch with Jian of course =)Start following churp churp twitts now ya! Btw, what is churp churp? How come I never see this movie screening in nuffnang one? The picture didn't appear in this post doesn't mean won't appear in next post ;p stay tuned!